Ice « "I do wander everywhere"
This entry was posted in Canada, Prince Edward Island, Weekly Photo Challenge and tagged autumn, ice, iPhone, leaf, November, transition. I’m sorry to hear about your WordPress editor issues. These photos are lovely though. Nice work. Thanks. Maybe I’ll just draft them on the iPhone in future and finish them on the computer; IF that’s possible. These are great pictures! We have no ice yet. Ours disappeared two days later; it was very warm on Friday. What an enormous temperature difference in such a short time! But the transition-pictures are beautiful! Ice can be a great subject, and a challenge for the fingers. i agree – beautiful images. i hope the editing issues are resolved soon. but if you hadn’t mentioned the challenges, i would have been none the wiser. these are brilliant. thanks for sharing. Thanks for visiting my blog page and for your nice comment. Agree w you about the editor but loved your shot – esp the comtemporary graphic!! I’m not sure which graphic you mean because, in a later edit I deleted a photo of a large thermometer because it seemed to be spilling all over the page. But thank you! 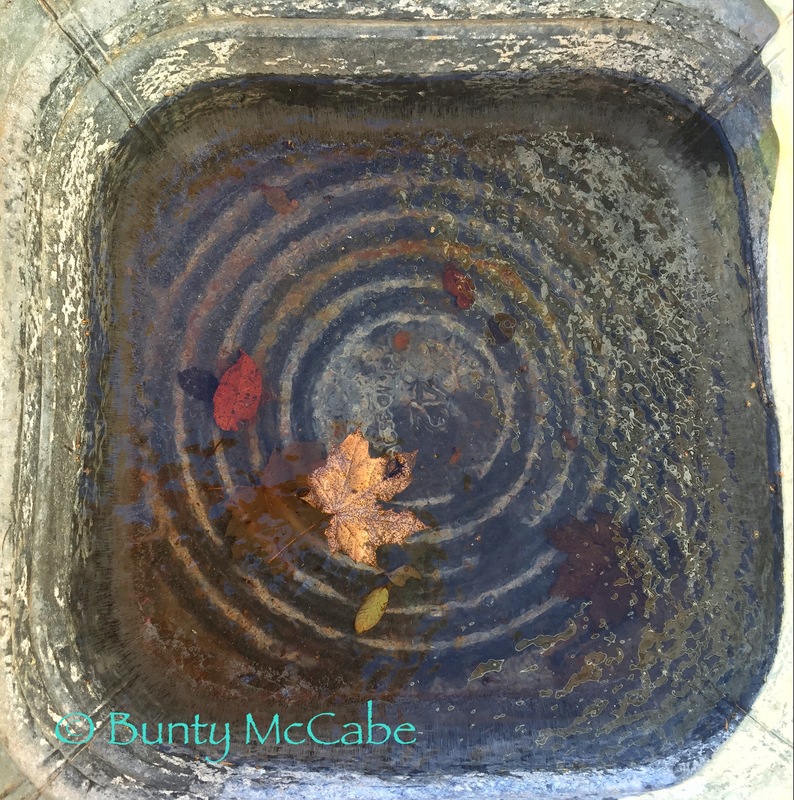 Hi Bunty- That seconds shot with the ice and leaves is awesome. Love the vibrancy of the image. I don’t miss living in a cold climate, but I wish I had the occasional chance to play (photographically) with ice the way you did so effectively here. If only one’s fingers didn’t turn to ice while doing it! Thanks for the positive comment, Steve. Well I find when I take a photo on my phone it’s easier to post it from my phone. I have just figured out how to get the iPhone photos onto my computer….so probably won’t do it very often again. Ha! They did that last year around the Holidays….I hadn’t noticed the snow falling this year until you mentioned it. In the real world, we are getting our first big snowfall tonight – about 15 cm (6 inches.) Thanks for visiting and commenting. Great job, Bunty! Love them all. It was quite a find. I was after the bubbles as it’s a category in next year’s photo show in Prince Edward Island. 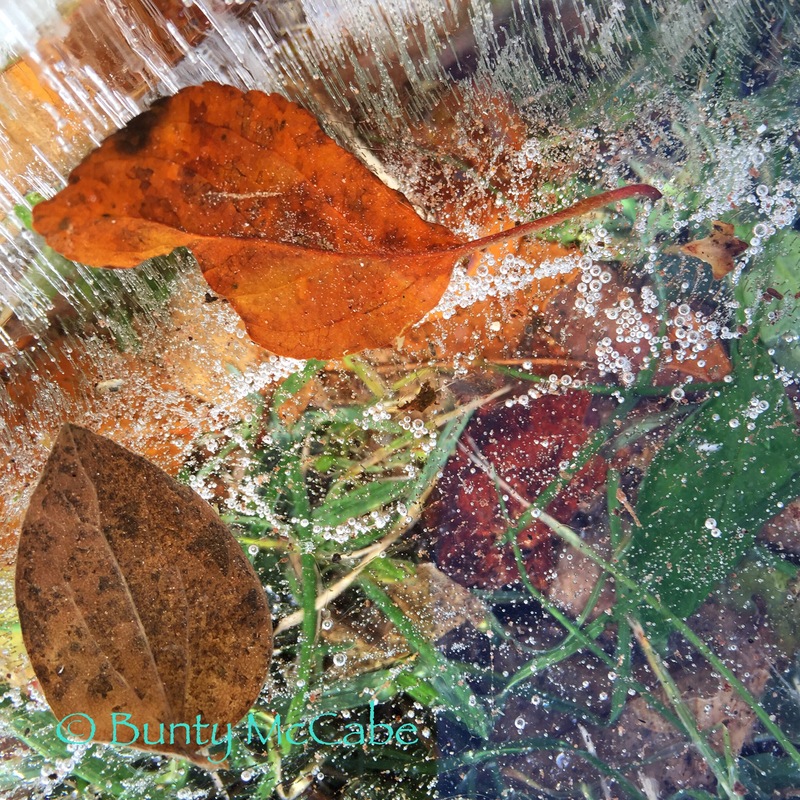 I love the mix of colours, textures and shapes of the leaves and the ice. I should try to paint that!